"An observable is a stream that represents a collection over time." "Reactive programming is based on propagating and responding to incoming events over time, declaratively." 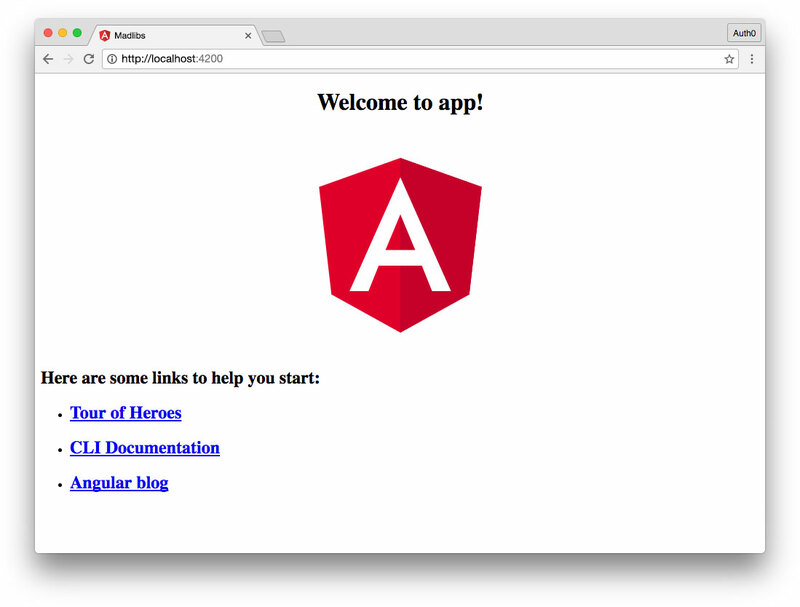 The API will then be accessible in the browser at http://localhost:8084/api with the endpoints specified in the madlibs-api README. To do this, we'll use subjects. Rx Subjects act as both observer and observable. This means that subjects can be subscribed to (observable). Subjects also have next(), error(), and complete() methods (observer), allowing them to emit values that all subscribers will receive. We'll create words$ and errors$ subjects that can push values in our Speech service and be subscribed to elsewhere in our app. These are the voice commands that we'll listen for. When we want to set up speech recognition in a component, we can call the Speech service's init() method, which in turn calls Annyang's addCommands() method to establish what we're listening for. You can read more about Annyang's API documentation here. We'll listen for the user to say the word "noun", followed by a named variable (e.g., :noun), which represents a one word argument. A good example of a match might be "noun cat". When this command is recognized, we'll use an Angular zone method called run() to execute a function that emits an object value from the words$ observable. What does this mean and why do we need to do this? Finally, we'll use Annyang's addCommands() method to pass our commands argument to speech recognition. Our component implements OnInit, OnDestroy and then we'll declare type annotations for the properties we'll use. 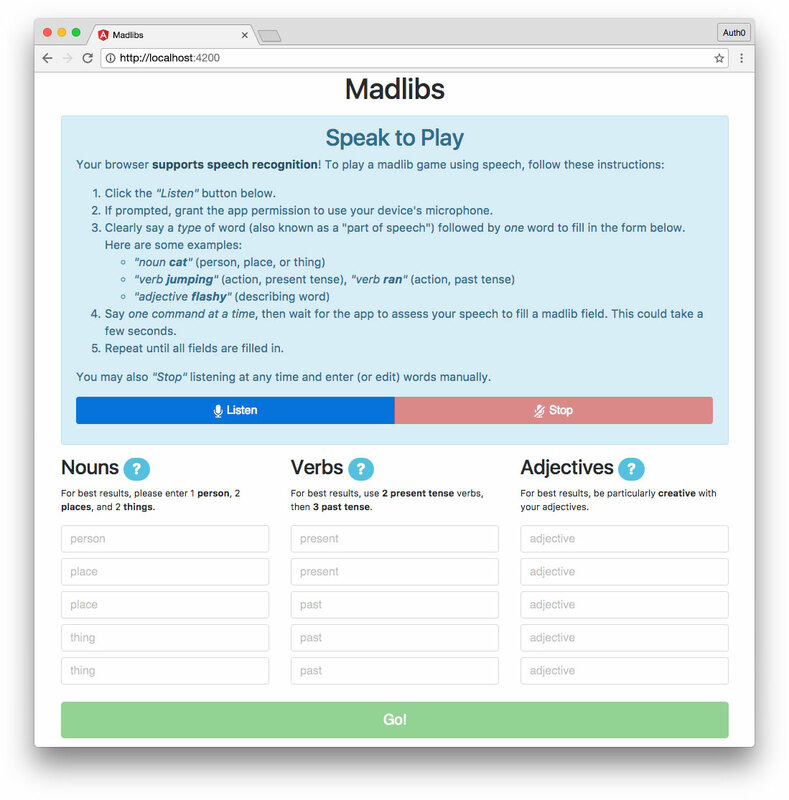 In order to organize our code and maintain separation of concerns, we'll create properties for each of the different parts of speech we're collecting: nouns, verbs, and adjectives (adjs). All types of words recognized from speech will come through the words$ observable, but we'll set up different subscriptions to build out arrays of each type. The type annotation for each of these properties is string, meaning an array containing strings. The errorsSub subscribes to the errors$ observable and runs the _setError() function, passing in the error object. If the err parameter is present, the error is logged to the console and the errorMsg property is set with the message to display in the UI. If no err parameter is present (such as in the cases with our _listenNouns(), _listenVerbs(), and _listenAdjs() functions above), the errorMsg is set to null to clear any existing errors from the UI. The start listening button will have the btnLabel accessor text on it and each button will be [disabled] according to the state of the speech.listening property. We'll also add the microphone icon images we saved to the src/assets/images directory earlier. Next we'll create two properties. 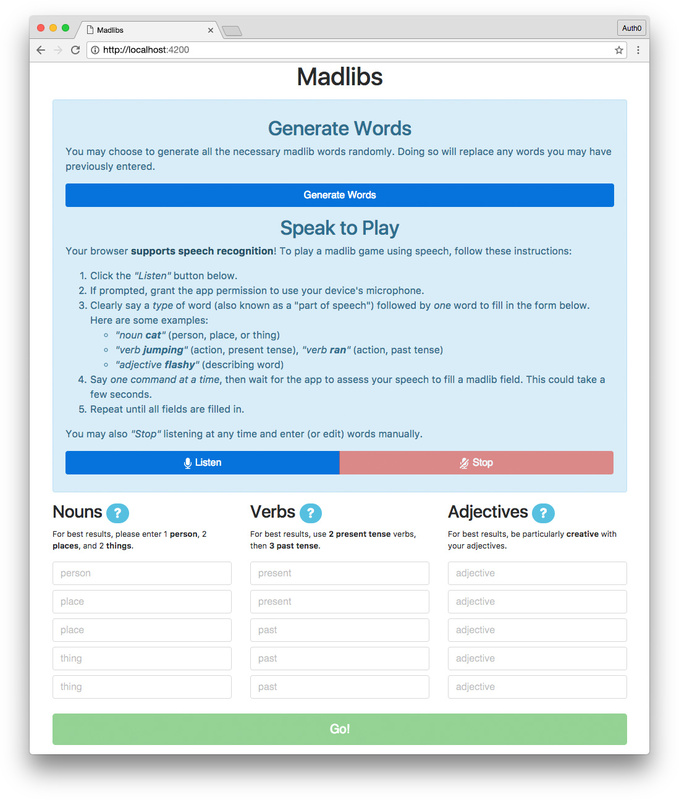 The first is simply a boolean called generating to use in the template once the user has submitted their words to generate a madlib. The second is a placeholders object containing arrays of what the input placeholders should be for each word field. 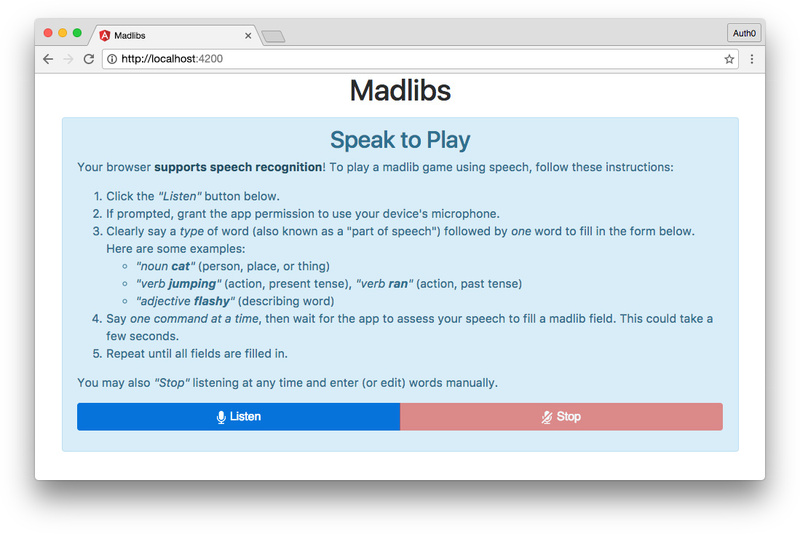 The getPlaceholder() method takes the part of speech as type and the iteration index, then returns the corresponding item from the placeholders property. We can use this function to display the appropriate placeholder text in each input field even when the input fields are inside a loop.